Kazakhstan, which is keen to attract foreign investments, urged European business circles to invest in the country. 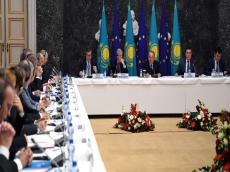 Kazakh President Nursultan Nazarbayev, speaking at the meeting with representatives of European business circles in Brussels, emphasized that European countries are the most important trade, economic and investment partners of the republic. “Over the years of independence, about $ 180 billion of direct investments were attracted to Europe from Kazakhstan. We closely cooperate with the European Bank for Reconstruction and Development, which has financed projects totaling more than 7 billion euros during this time,” said the head of state. The trade turnover with European countries has been steadily growing in recent years, about 3,000 enterprises with the participation of European capital operate in various spheres in Kazakhstan, Nazarbayev stated. “Among our major partners are Alstom, Linde Group, Air Liquide, Danon, Vikat, Heidelbergcement, which successfully operate, open up modern production, create jobs and make profits,” Nazarbayev said. He also told businessmen about the advantages of Kazakhstan’s geographical location. “Five railway and six international road routes that connect China and other Asian countries with Europe through Russia, the Caspian and Black Seas, as well as Iran and Turkey, pass through Kazakhstan. Now, cargo delivery to Europe from China via Kazakhstan and back takes four times less time than delivery by sea,” the president noted. He also spoke on the issues of improving the investment climate and creating favorable conditions for doing business. “Kazakhstan is an associate member of the OECD Investment Committee and has joined the Declaration on International Investment. We have a Council of Foreign Investors under the President, in which 13 foreign companies of its 33 members are representatives of Europe. For citizens of 62 countries, including 33 European countries, a visa-free regime has been introduced,” the head of the republic said. In conclusion, he expressed confidence that the meeting would strengthen the mutually beneficial partnership between the countries. Kazakhstan and EU concluded the Partnership and Cooperation Agreement in 1994. Expansion of partnership and cooperation of Kazakhstan with the European Union and its member states was ratified by the country's parliament in March 2016. Kazakhstan is also part of the EU Central Asian Strategy for the New Partnership. The EU is the largest trading partner of Kazakhstan. Kazakhstan exports mainly energy to the EU, and the EU exports machinery, transport equipment, and chemical products.